Andhra Pradesh: Almost 100 senior doctors in the thirteen districts of the state can look forward to a good time ahead. News has come that the medical and health department working on a is finally working promotion list. The list is expected to be finalized as soon as by next week. The state has confirmed the news, close to the date on an MCI inspection of the medical colleges. Considering that the government doctors have been complaining that during the MCI inspection time; and the council is allegedly deceived by ghost faculty created at the medical colleges- this is an important development. The promotion news will only help in preventing such malpractices.It is expected that there would be no false presentation of (deputing) associate professors and second internal examiners from one medical college to another medical college as professors and first internal examiners for post graduate and super-specialty admission, a media report stated. Such deceived declarations only put their job at risk, many doctors implied. Subba Rao, in-charge director of medical education (DME) has now implied that almost 100 names from various specialties and sub-specialties have been shortlisted for promotion. Besides doctors from 23 specialties, there is an addition of dental specialty having made it to the list. Few issues relating to the promotion of associate professor to professor level had to be dealt with. 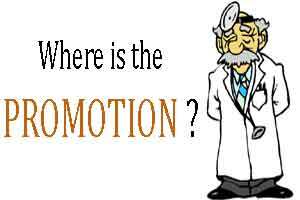 Senior doctors are required to meet certain criteria for getting promotions. This criterion includes such as four research papers to be published in standard indexed medical journals. ( Besides, two papers for being promoted from assistant professor to associate professor level, along with two research papers for promotion from associate professor to professor level). In addition, the doctor needs to possess a teaching experience of at least three years or more, for getting promotion from associate professor to professor level. The DME implied that some senior doctors did not fulfill the criteria-more specifically the research paper publication by August 31, 2015. Following which they were given time to publish by March 31, 2016. The health secretary was informed of these pending promotions. Now, the MCI inspection team will be informed that the associate professors are actually eligible for promotion as professors and their names are on the list. “The name list of doctors due for promotion will be send to the General Administration Department (GAD). GAD will hold department promotional committee meeting, which will give the green signal for bringing out the final promotion list based on fulfilment of criteria, seniority, available posts and vacancies. Then the GO of doctors’ promotion and postings would come out. A few professors working in Telangana but of AP origin will also be posted in AP,” said Dr Subba Rao to TOI. We request you kindly persue the matter immediately and do the justification to Medicine department teaching faculties as well as students with full pledged faculties.